Narcissism is the pursuit of gratification from vanity or egotistic admiration of one’s own attributes. The term originated from Greek Mythology where the young Narcissus fell in love with his own image reflected in a pool of water. That’s the definition we found on Wikipedia and we won’t go any deeper. 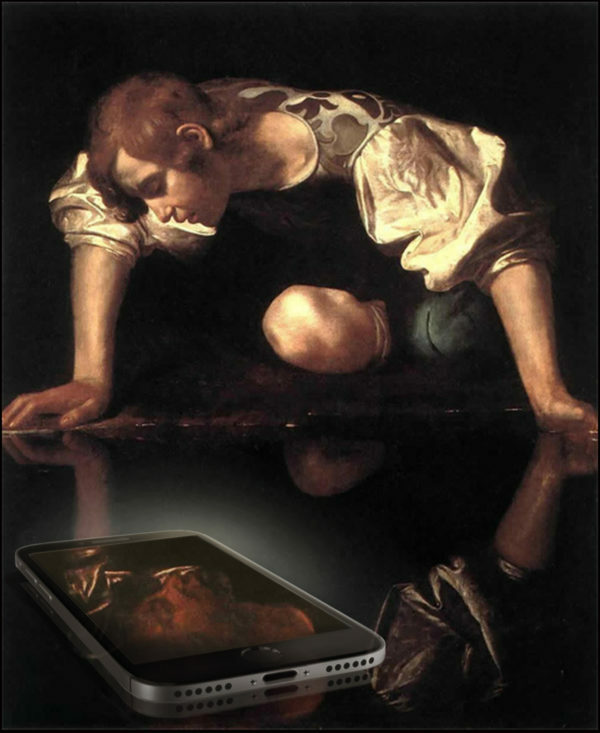 Interestingly enough, no subject invites to a reflection better than Narcissus. The pool of water, today, has been replaced by the Gorilla glass, the almost unbreakable crystal surface of our digital gadgets and devices. In the past it was enough to dip your fingertips into the water to break the mirrored image into a series of expanding circles, thus interrupting the illusion of reality. Today your fingers, like ice-skaters, slide and swipe on the cold glass, activating and multiplying layers of alternative worlds that we grew to see as a perfect alternative to the real one. Narcissism, today, is not just the self-serving act of posting pictures of ourselves on social networks. This would be just a perpetuation of classic self-infatuation. We do more and worse than that. We discard what’s real and select what’s hyper-real. We retouch, slim and filter our face, then we add up Instagram or Hipstamatic color filters, and God knows what else, in order to create an idealized projection not of the way we’d like to be, but the way we’d like to look. That’s a fantastic performance in stupidity. This is Narcissus 2.0, the artificial eugenic of a super-ego aspiring to photoshop surgery.